So as you can imagine my menu plan was all over the place last week and things got shuffled around a bit but here’s the main thing….by the end of the week my fridge was empty. 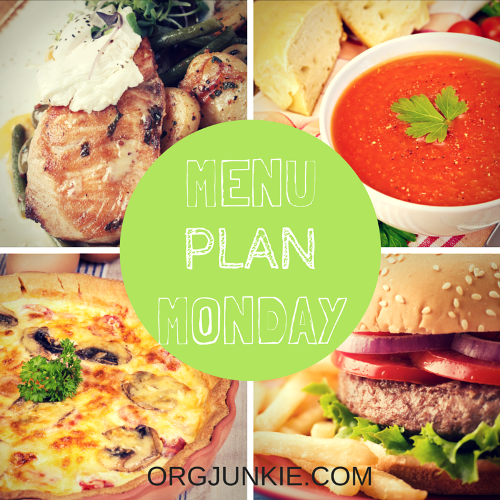 That’s the beauty of a menu plan! I may plan recipes for a certain day but as curve balls are thrown at me I can move recipes around from one day to the next depending on my needs. I have all the necessary ingredients in the fridge ready to go, as I shop once at the beginning of the week, so it really doesn’t matter when we eat them as long as we do and no food gets wasted. Gosh I love menu planning! 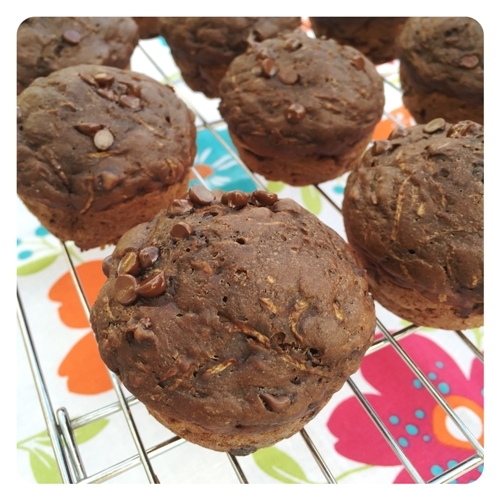 I had planned on making some different zucchini muffins last week but changed my mind when I saw this recipe for Healthy Double Chocolate & Greek Yogurt Zucchini Muffins that Tammy from Organize Yourself Skinny posted on Friday. I had company coming over on Sunday so I decided to whip up a batch for them. I was told they were very good, even my picky 9 year old loved them. Dara over at Cookin’ Canuck has compiled a great list of her family’s favorite healthy school night tried and true recipes. If you need some new recipes for your rotation maybe you’ll find something you love here. Have a deliciously organized week y’all! Thanks for hosting this each week! That is scary about the ER trip. I’m glad it turned out ok. And thanks for sharing. My Mom and sister both have Celiac Disease, so I will be sure to pass that info along to them. Thanks for sharing the info Jamie, that’s why I ultimately decided to share the product. I almost didn’t but would just really hate for someone else to get hurt. Thanks as always for hosting! I passed along your warning about Chex oatmeal to my friend who has celiac – oy! I’m glad your son is ok! Oh thank you Cathy, I would really hate for anyone else to get hurt by this. So scary! I hope your family has a nice, quiet week ahead. Salmon is popular around here 🙂 Sorry to hear about that scare but glad you both are better! Allergies are no joke! I’m awful about sticking to the menu by day so I just plan the menu but wing the days. Heres to a nice calm week! I must not be putting my link up right? Can I get anyone to help me? First timer here. Nicole where are you having problems, I’d love to help you out. Are you getting any error messages? I already got it figured out. Thank you though. I just opened my wordpress site switching over from blogger so it was hard to figure out everything in one day but I got it. I am glad your son is doing okay. It is really scary to think you know what is in a product, even what the label states, and then find out it is not what it seems. Thank you for hosting this wonderful sight. I am trying to get some type of order back in our months…MONTHS…of chaos and get back to menu planning and cooking for the freezer. Your menu sounds pretty good. I am getting some meal plans together, grocery list (won’t need much as I have been working on stocking up a bit) and hope to be ready to go by payday. It has been so long since I posted to my blog that I really had a hard time even logging in. I’m so glad your son is doing ok after that scary reaction! I really love your argument for menu planning – we can’t control everything in life (as your week proved), but by controlling what we can control & planning ahead we can make our lives so much easier. I’m looking forward to a deliciously organized week!